Does what it says - warm removable inner and bright wipe downable outer waterproof coat. Easy to put on our Cocker Spaniel. does not have to be washed after a muddy walk, can be wiped down whilst the mud etc. is still damp. Ordered two coats, but realised, after they came, that the description of the way to measure your dog for fit, is not at all appropriate for whippets. Have now received replacements and delighted. 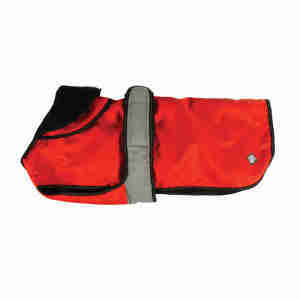 Easy to fit, cover the dogs well, like the way the & collar folds back but is there for heavy rain. Obviously not tried for warmth yet. Not sure why the same coats in different colours are priced differently.